Press releases will attempt to convince you that we're currently living in the golden age of TV, but in the 1950s writers as respected as Paddy Chayefsky, Reginald Rose and Rod Serling were knocking out hour long teleplays on an almost weekly basis, often for live broadcast plays. Most of these transmissions have been lost to history - this was long before the VCR entered the living rooms of the world - but some were so lauded they were adapted for the big screen. 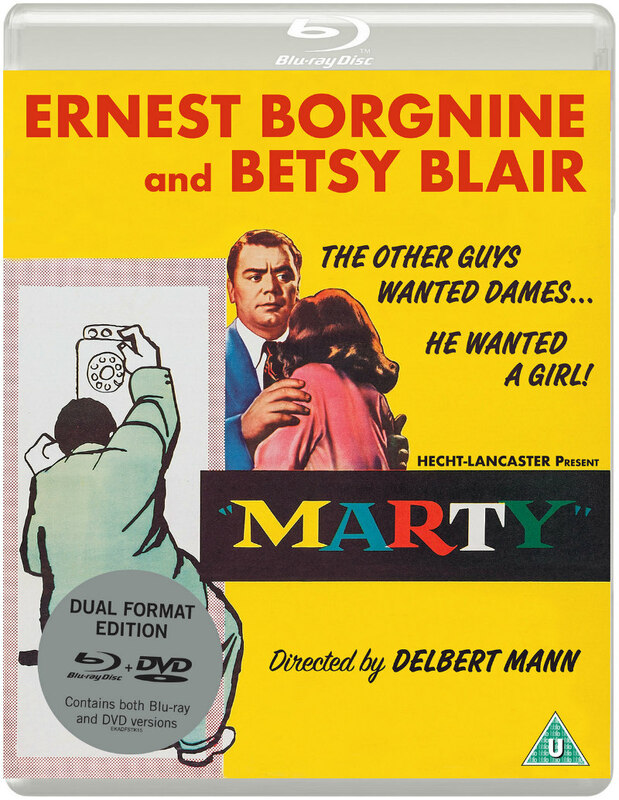 The most famous example is Sidney Lumet's adaptation of Rose's 12 Angry Man, but Delbert Mann's Marty doesn't lag too far behind. Chayefsky had originally written Marty as an episode of anthology drama series The Philco Television Playhouse, broadcast live with Rod Steiger in the title role on May 24th, 1953. Despite Hollywood's obsession with delivering the sort of big screen spectacle the gogglebox couldn't compete with, Mann and Chayefsky were allowed to adapt their teleplay for a cinematic release, adding subplots to pad out feature length. Ernest Borgnine took over the role from Steiger, not only making it his own but instantly turning Steiger's performance into arguably a piece of miscasting. Jovial on the outside, tortured on the inside, Italian-American Marty Piletti works in a local butcher shop in the Bronx, charming the elderly female customers who frequent his store. With his schlubby appearance, he's unable to work the same charm on younger women, and while his brothers and sisters have all gotten themselves hitched, Marty remains unmarried, resigning himself to permanent bachelorhood. Every Saturday night, Marty puts himself through the emotional torture of frequenting a New York nightclub with his ever-enthusiastic friend, Angie (Joe Mantell), and tonight the venue is the Stardust Ballroom, an expansive fleshpot frequented by hopeful young men who with their Brylcreemed pates and ill-fitting suits, resemble Ronnie Kray in a hall of broken mirrors. The sight of all these losers lined up along the wall like boys at a Catholic school disco is enough to turn any woman into a lesbian. 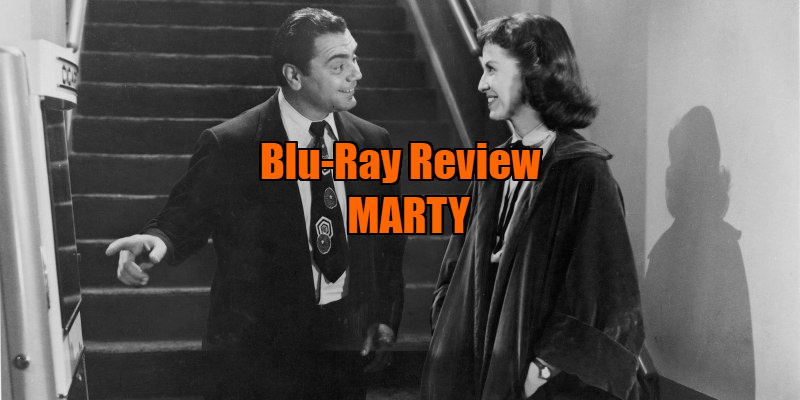 Marty doesn't expect to find love tonight, but he bumps into a kindred spirit in the form of Clara (Betsy Blair), a teacher who had been ditched by her date, who even attempted to pay Marty $5 to take her off his hands - what a charmer! Marty attempts to cheer up Clara in his awkward manner, using tone deaf lines like "Us dogs gotta stick together," but Clara doesn't seem too bothered, as like Marty, she's resigned herself to being left on the shelf. Of course, while she's not exactly Marilyn Monroe, Clara is by no means the "dog" every man in New York, and even Marty's mother (Esther Minciotti), seems to think she is (at time of shooting, Blair was married to Gene Kelly; not bad for a dog eh?). Let's face it, in both looks and intellect she's way out of Marty's league, but you have to remember this is 1955 we're dealing with. The two spend an evening together, Clara struggling to get a word in as Marty regales her with tales of the war and insights into the butchery trade. The big lug is smitten, and somehow the feeling is mutual, but Marty finds himself torn between his affection for Clara and the disdain of his disapproving family and friends. Like It's a Wonderful Life, Marty is one of those films that has acquired a far jollier reputation than its melancholy narrative deserves, and in contrast to its perky theme tune, it's a film that ventures to some dark places. Prior to meeting Clara, Marty is a truly tragic figure, confessing to his date that he's even contemplated suicide in the past, so weighed down is he by his crushing loneliness. He recites a war story with such glee that you get the feeling the Army, with its absence of women and romantic expectation, gave Marty his happiest years. As great as Chayefsky's dialogue is, it's the moments between the words that have the greatest impact in Mann's film. Early on, Marty makes a phone call to a "big girl" he met a month ago on a cinema trip, and as Mann's camera slowly tracks into Borgnine's expressive face we can't hear the voice on the other line but we see the impact of rejection on Marty's soul. Later, a similar tracking shot takes us into a teary closeup of Clara, Marty having reneged on his promise to phone her up. There's a brutal honesty to the portrayal of Marty and his stubborn male aspirations. He refers to himself as a "fat, ugly man," but in a telling moment, a friend of his interrupts his late night stroll with Clara with an offer to pass a good time girl ("Money in the bank!") onto Marty. Rather than dismiss the offer outright, Marty pauses and looks at Clara for a brief second before rejecting his friend's proposal. It's testament to Borgnine's affability in the role that we don't immediately turn against him at this point. Mann and Chayefsky's movie ends on a happy, ecstatic note for both Marty and Clara, but having witnessed Marty's cousin's bickering relationship with his wife in a minor subplot, there's a large enough seed of doubt planted to suggest that should we return, Before Sunset style, to Marty a decade later he may well have five kids, a mortgage on a failing butcher's shop and be in mourning over the loss of his bachelorhood. But for one New York night in 1955 at least, two discarded souls found a light of hope in each other's eyes. Eureka's disc also includes the original teleplay, starring Steiger; Burt Lancaster introduces the original trailer; a vintage featurette on the teleplay; and an interview with film scholar Neil Sinyard. Marty is on dual format blu-ray/DVD from Eureka Entertainment now.